This could be your new basement conversion or extension project. We have got many cost effective and economical design solutions to create an excellent additional area in your home. Basements are a viable option to achieve the very desirable extra space and increase your habitable area by up to 50%, whether you are a domestic customer or property developer. Due to the unique sump pump package systems used by Basement Services Ltd. our basement development solutions can be adapted to suit any design. Basement Services Ltd. provides basement services in accordance with the British Standard 8102 code of practice for protection of structures against underground water. We are certified installers of Delta Membrane Systems. Converting your basement with Basement Services Ltd. will add value to your property in excess of the project costs. Being underground, a waterproofed basement benefits from less heat loss and improved acoustics. Turn your dream basement into a reality with our highly experienced and hard-working eastern European team. Please contact us to discuss your requirements. 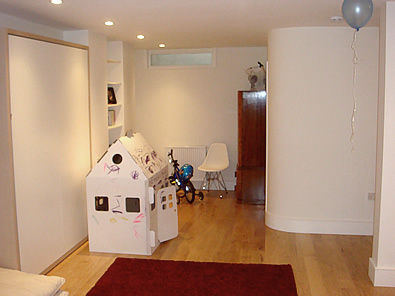 We convert basements in Fulham, Chiswick, Shepherds Bush, Kensington and all surrounding areas in North and West London.